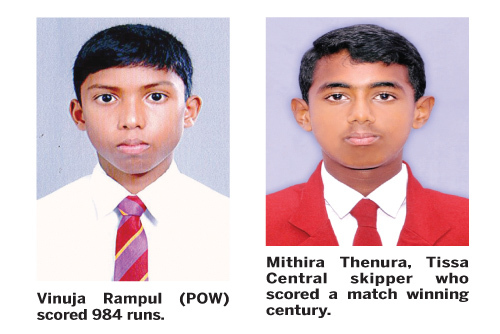 Mithira Thenura scored his fifth century of the tournament to guide Tissa Central College (A) Kalutara to emerge champions of the Singer Trophy Under 13 division 1 inter-schools cricket tournament on yesterday. Tissa Central College (A) Kalutara won according bonus points against defending champions Prince of Wales College (A) Moratuwa in the final played at Thurstan ground. Tissa MMV Kalutara won the toss and elected to bat and scored 217 runs for 4 wickets in 65 overs. Mithira Thenura skipper of Tissa Central scored an unbeaten 109 off 138 balls with 15 fours. Shashmika Weerasekara also contributed with a half century. Prince of Wales Moratuwa in reply scored 146 runs for 5 wickets in 31.4 overs with Induwara de Alwis scoring 46 and Vinuja Ranpul 45. Tissa Central reached the under 13 division one final for the first time in their history and they won in their first attempt. Thenura ended the tournament with an aggregate of 942 runs and Vinuja Rampul of Prince of Wales finished as the leading run scorer with 984 runs and 3 centuries.